Radon is a colorless, odorless, tasteless gas caused by the natural breakdown of uranium in the soil under your home. This hazardous gas seeps into homes from the surrounding soil through porous cement, sump pumps, cracks in the foundation, crawl spaces, etc. Your home acts like a vacuum, drawing radon in. When inhaled, radon gives off radioactive particles that can damage the cells that line the lung. Radon is the second leading cause of lung cancer and the number one cause of lung cancer in non-smokers. 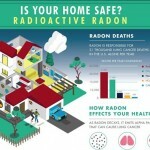 Radon kills 22,000 people every year in the U.S.
Radon is present in every home. Approximately 30-40% of the homes tested nationwide have elevated levels of radon that need to be corrected, according to the United State Environmental Protection Agency (USEPA). Any home can have a radon problem: old homes, new homes, well-sealed and drafty homes, and homes without basements. In fact, you and your family are most likely to get your greatest radiation exposure at home. That is where you spend most of your time. Your level of risk is dependent upon the level of radon in your home and the length of time you are exposed. To be sure that your home is safe, do what millions of Americans have already done…have your home tested! The soil. Radon is produced from the natural decay of uranium that is found in nearly all soils. Uranium breaks down to radium. As radium disintegrates it turns into a radioactive gas…radon. As a gas, radon moves up through the soil and into the air you breathe. While radon is present everywhere, and there is no known safe level, your greatest exposure is where it can concentrate – indoors, where you spend most of your time – at home. Your home can have radon whether it be old or new, well-sealed or drafty, and with our without a basement. Since radon is produced from soil, it is present nearly everywhere. Because soil is porous, radon gas is able to move up through the dirt and rocks and into the air we breathe. If allowed to accumulate, radon becomes a health concern. Pathways are routes the gas uses to enter your home and found anywhere there is an opening between the home and the soil. Air Pressure between your home’s interior and the exterior soil is what helps to draw radon gas into the home via the pathways.